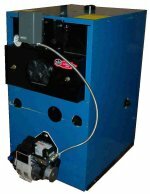 Please note that efm K Boilers will not be manufactured after September 2012. A limited supply will be available until all units manufactured prior to September 2012 are sold. Parts will continue to be available for the K Boilers.